As members of the Body of Christ, the parish of St. James, Lake Placid, Florida proclaims our belief in the message and mission of Jesus Christ. With God's Grace, the example of Jesus, and the guidance of the Holy Spirit, we seek to live out that belief as a community of worship, of shared faith and of service where each member shares with others the gifts and talents received from God. 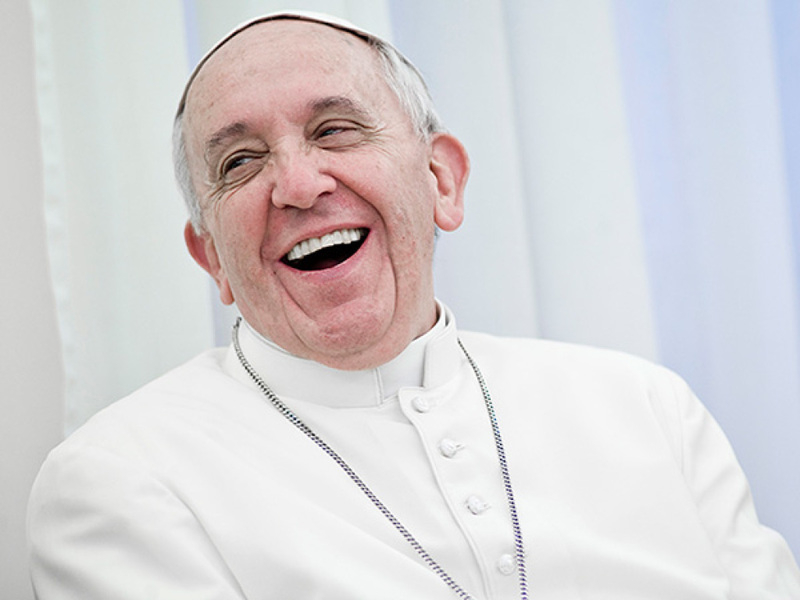 Pope Francis' Letter to the People of God, regarding sexual abuse in light of the outcome of the Pennsylvania Grand Jury. Father Vincent came to the United States from Italy at the age of 15, where his family settled in the Cleveland, OH area. He has one sister. 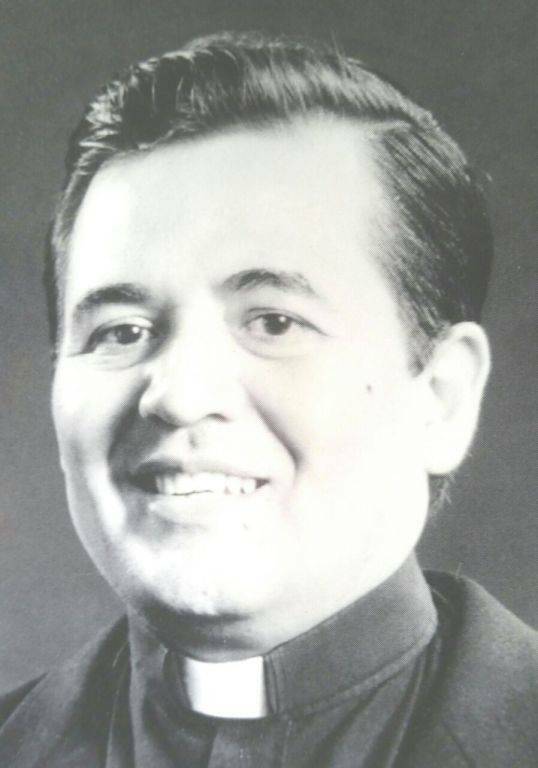 Father was ordained to the priesthood on May 8, 1976 and has previously served at St. Martha’s in Sarasota, FL and as pastor of St. Michael in Wauchula and St. Paul in Arcadia. WELCOME, FATHER! We look forward to continued spiritual growth with you here at St. James! Fr. Victor Caviedes was born in Peru. 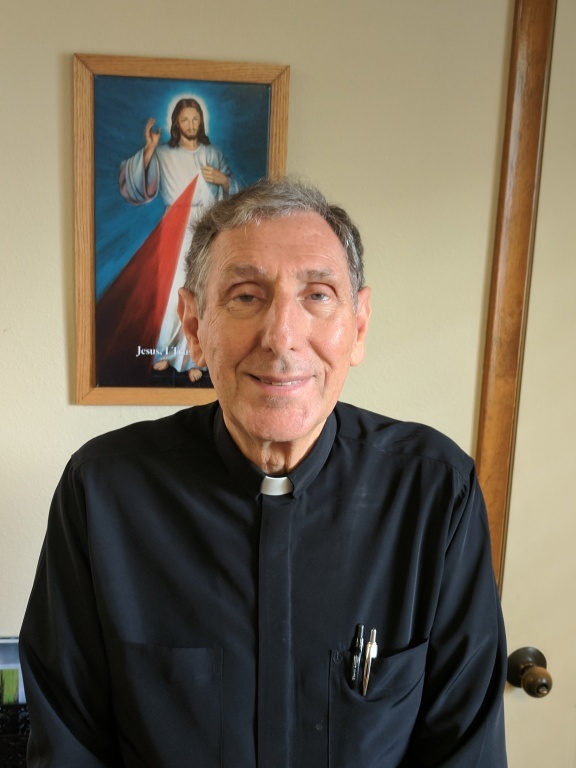 After studying in Peru and Spain (he has a degree in Social Psychology and a doctorate in Philosophy), he moved to the U.S. in 1997 and was ordained along with Fr. Anthonio in 1999 by Bishop Nevins. Fr Victor came to St. James in December of 2015 from St. Catherine Parish in Sebring. Jesus is asking for repentance from the people, so that they will always be ready. They will never know when they are going to die. This is the main reason behind what Jesus is saying in the Gospel today in regard to the Galileans whose blood Pilate had mingled with the blood of their sacrifices, and the ones who were killed when the tower of Siloam fell. Jesus tells us that, without Holy Baptism, no one will enter the Kingdom of Heaven (cf. Jn 3:5); and, elsewhere, that if we do not repent, we will all perish (Lk. 13:3). This is all easily understood. Ever since man sinned, all his senses rebel against reason; therefore, if we want the flesh to be controlled by the spirit and by reason, it must be mortified; if we do not want the body to be at war with the soul, it and all our senses need to be chastened; if we desire to go to God, the soul with all its faculties needs to be mortified: (St. John Mary Vianney, Selected Sermons, Ash Wednesday). APRIL 1st—Monday. DOV Life Planning Seminar, 10AM-12:30PM, Social Hall. RCIA, 6:30PM, Social Hall. 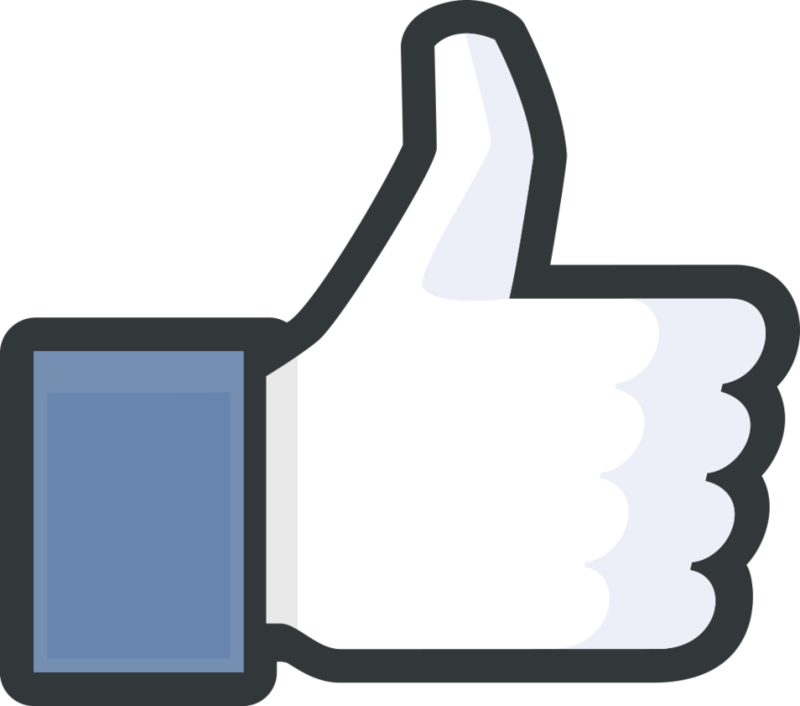 SVdP Meeting, 7PM, Social Hall. APRIL 2nd—Tuesday. Prayer Group, 7:00PM, Social Hall. APRIL 3rd —Wednesday. Choir Practice, 3:45, Church. Confirmation Class, 6:30PM, Social Hall. SAFE Environment Training, 6PM-8PM, Social Hall. APRIL 5th—Friday. Stations of the Cross after 9AM Mass, Church. Rosary Makers & Kraft Korner, 10AM-1PM, Social Hall. 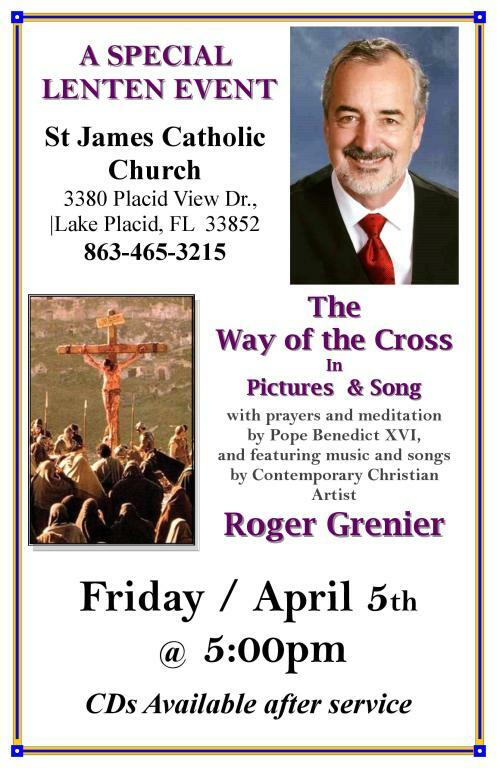 “The Way of the Cross in Pictures & Song” by Roger Grenier, 5PM, Church. 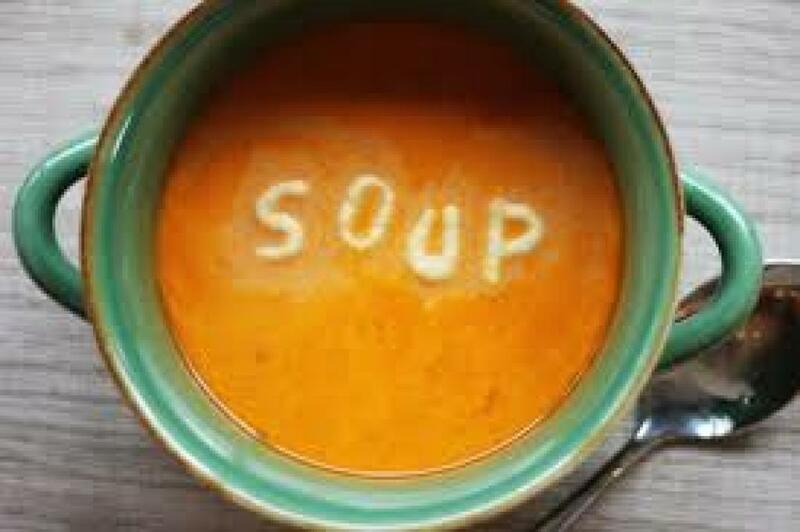 Soup Social, 6PM, Social Hall. APRIL 6th—Saturday. SAFE Environment Training, 9-11AM, Social Hall. APRIL 8th—Monday. RCIA, 6:30PM, Social Hall. APRIL 9th—Tuesday. Prayer Group, 7:00PM, Social Hall. Knights of Columbus, 7:30PM, Social Hall.